What I love about baking is the almost magical way in which ingredients, in the right environment, interact to create something wonderful. This recipe by Herve, which I came across via one of my favourite blogs Poires au Chocolat, is a perfect example of this. The mousse has only two ingredients – chocolate and water. I have read countless recipes where it cautions against water coming into contact with melted chocolate as it will seize. However in this recipe this is exactly what you do and yet it creates the most wonderful soft mousse. I made this for my husband on St Valentine’s Day so I felt it was necessary to dress it up with the culinary equivalents of fancy bra and knickers. I added a bottom layer of raspberries and Chambord, topped with some lightly toasted hazelnuts and served it with a chocolate sable biscuit on the side. It would be perfectly lovely just by itself though. What did you make for your Valentine? This is a very quick dessert so it’s imperative that everything is ready before you start. Have the serving dishes out. Place some ice cubes in a large bowl and place a smaller bowl inside of this (the mousse will be whisked in this smaller bowl). Have a rubber spatula and whisk ready. Place the chocolate and water in a small saucepan and melt over a lowish heat, stirring with the spatula, until melted and smooth. Pour into the chilled bowl and whisk! whisk! whisk! The mousse will thicken as it cools; whisk until it forms thick soft ribbons. Pour into the serving bowls. Garnish as you wish and serve. Refrigerate if you’re not serving it immediately. I made mine several hours ahead of serving and it kept very well in the fridge. 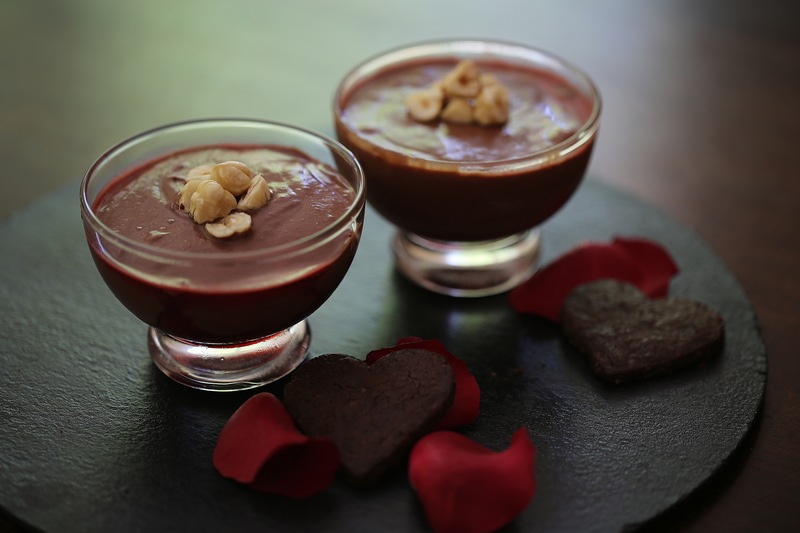 Posted in Puddings & MoussesTagged Chambord, chocolate, dairy free, easy dessert, egg free, food, food photography, gluten free, Herve, mousse, Poires au Chocolate, Valentine's Day, vegan, vegetarianBookmark the permalink. Wow that looks great. I thought chic mousse always had to have eggs (raw) which doesn’t float my boat. Can you use milk chocolate or white chocolate if you want different flavours? I know what you mean about raw egg! This would be great to try with different types of of chocolate. I plan to make it again so I will let you know how it goes. Oh my gosh, I laughed out loud at your bra and knickers comment. The raspberries and Chambord additions sound fantastic! I’ve seen this recipe on a few blogs previously and absolutely love the idea, especially since I’ve gone dairy free recently.. I can’t wait to give it a try. yours looks lovely and I bet your hubby absolutely loved this on V-day! Thanks Christine, we both enjoyed the dessert very much. I’m not surprised that you have seen it on other blogs, it’s so amazing! I hope you try it soon. I’d like to know what you think of it.